Multifunctional food processor to chop vegetables and fruits, great for French fries, wedges citrus fruit, chops and dices. Ultra Sharp German 420-grade hardened stainless steel blades, cut through objects swiftly, cleanly and evenly. Easy push down motion for chopping, chop directly into BPA-Free container without mess prepping. Soft grip pusher ensures better protection. Non-skid base, study, durable construction. Space-saving, all parts store in the unit. Pieces come apart for easy cleaning. Dishwasher safe. 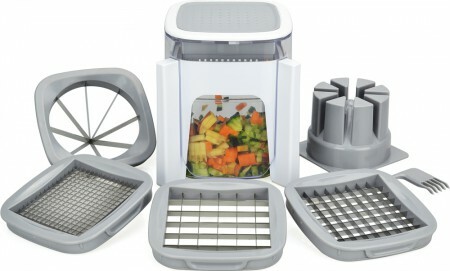 Surpahs X-CUT Multifunction Vegetable & Fruit Chopper.